By the way, these aren't in order of liking, of course! 1. Henry Chinaski - The Post Office/Ham on Rye/Factotum/Barfly-the movie (etc...) (Charles Bukowski) The bitterly honest semi-autobiographical anti-hero. Not that he's "lovable" or anything, but with his dark humour and straightforwardness, he does seem kind of cool. To an objective viewer, of course. 2. Jonathan Teatime - Hogfather - Discworld series (Terry Pratchett) "It’s pronounced Tee – Ah – Tim – Eh,” said Mister Teatime. And he doesn't like it when you pronounce it otherwise. Teatime's an absurdly cruel assassin. His eyes make his boyish handsomeness disappear in an instant: he has one glass eye, and one off-white eye, with a pinhole sized pupil. Not to mention, he is a genius. 3. Jack Torrance - The Shining (Stephen King) Jack Torrance is a classic jerk. He is scary and has a horrible temper. Not to mention, he is an alcoholist. The struggling writer may be the ultimate antagonist for the sake of the story, but all you really feel for him is pity. Either way, Jack Torrance is an amazingly built character! 4. Michael Corleone - The Godfather/The Sicilian (Mario Puzo) The youngest son of Don Vito Corleone does make a very likable jerk! He is cunningly intelligent, strong and loyal to the family. He is bold, violent and ambitious and it is kind of awesome how he goes from being totally uninvolved in his "family business" to being a cold-blooded Mafia don, and his father's successor. 5. 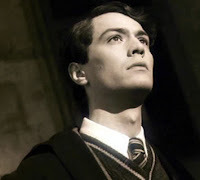 Tom Riddle - Need I even say? Fine, Harry Potter series ( J.K Rowling) It is a gross understatement to call Voldemort a jerk! But the charming, brilliant student who had a taste for the Dark Arts, who had followers right from school and who went on to become the darkest, most evil and powerful wizard ever. That's right, Tom Riddle fits the description perfectly. 6. 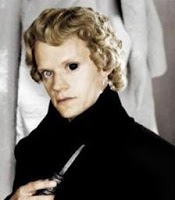 Anthony Crowley - Good Omens (Neil Gaiman and Terry Pratchett) He is actually a demon. But Crowley(in his human form)- with the dark hair and sunglasses, his 1926 black Bentley (which he loves), a posh flat in London, his love for high end technological gadgets, and his dark humour- has to be the best jerk ever! 7. Lestat de Loincourt - The Vampire Chronicles (Anne Rice) Ah, the 'Brat Prince'. He is amazing looking, bold and defiant, but also a loner. He is charismatic, loves literature, is the lead singer in a rock band, is a fashionista and loves being a vampire. What more can you say? 8. Patrick Bateman - American Psycho (Bret Easton Ellis) "Facelessand desensitized, bereft of love, family or real friends, Bateman is obsessed by physical perfection and preoccupied by the obsession to fit in." I haven't finished reading the book, but Bateman is gruesome and a complete jerk, but kind of awesome anyway. And if that's not enough, well, think of Christian Bale! 10. Severus Snape - Harry Potter series (J. K Rowling) How could I have possibly missed Snape? He is the biggest jerk on the planet, really! For someone who can manage to love a person years after they are dead, he is mean. But believe me, his pathetic love story is not the reason why I like him. It is that "Half-blood Prince" in him I like; his crazy intelligence and his endless fascination for the Dark Arts! I chose Snape too. I just hate how he treated Harry and his friends in the first six books. 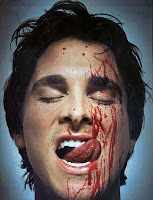 Patrick Bateman *shiver* and the pic didn't help. Tom! Oh, what a silly prick! 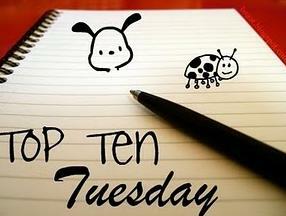 I thought I was the only one with Lestat on my list! I went with Draco instead of Snape. I feel sorry for Snape a lot of the time. I'm really going to try to get into the Discworld series over the next few months. It appears that I'm going to encounter some real jerks!!! Great call on Lestat. Jerks they may be, but I love so many of these characters! Especially Vetinari, Snape and Lestat. I love your choices of Jack Torrance, Riddle and Snape. And although Snape is a jerk, I can't help but have a liking for him too. He is a brillint character and the story would not have been the same without him. Great list! Oooh, you picked some evil dudes. I agree with your Harry Potter choices, but the others are too evil in my view, to be called jerks with impunity. Ha! I almost put someone from The Godfather on my list, but who to choose? There are tons of jerks in that book. Great choices! I can't believe I didn't think of Teatime. I think (with the exception of Snape and Begbie, who are two literary jerks that I love) that I was trying to come up with a list of people that I didn't like at all, so maybe that explains it. I have Patrick Bateman on my list. He is unbearably dull and narcissistic. He would be a jerk even if he didn't kill people. The rest of your list is great as well. Haha! Nice choices but i have to say this. Sue you for calling Snape a jerk! Sue you! I love that character! Love your spin on Voldemort, Priya! You make a swell case there! And Crowley? Perfect choice. @Jade, Gabrielreads - I know, I sort of went with characters that are complete jerks, but I somehow still like! And I do like Snape!! @Booknympho - For me, Michael was like the biggest jerk from the Godfather, because first he was alright and then he turned himself into one!! @LBC - Exactly, it's not just that Bateman kills people, he's a jerk either way! Laurie - ;) And I know, Crowley is awesome!! The Xeno - I like Snape too, you know! But that doesn't stop him from being a jerk! !